My furbaby Blue passed away today. He was the sweetest kitty ever, never hurt anyone even put up with all the kids dragging him around even when he was bigger than they were. I remember my daughter would pick him up and carry him around when she was just a toddler. He was bigger than her and just let her pull him around and throw him over her shoulder- and he never was declawed even. He didn't need to be, that's how gentle he was. My kitty Blue was born New Year's Day 1999- under my bed. I had both Blue's mom and dad. His dad Harley passed several years ago, Angel is still here but old- going on 14 which is really old in kitty years. My kitty Angel gave birth to a whole litter under there. Blue was the only one we kept. He was amazing- a Siamese born to a tabby torty and an orange Tiger. 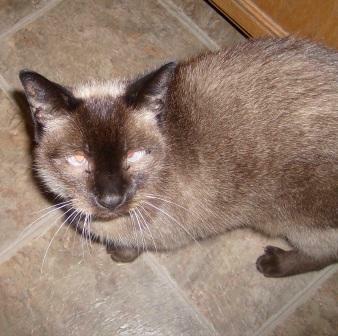 He had all the Siamese markings- dark tips and blue eyes. Plus he was big. Angel is and always has been a small girl. Harley was average. Blue stretched out from nose to tail was over three feet. A gentle giant. Angel is the only kitty I have left of my original 4 who had been with me since I was a still pretty much a kid myself. It started with Lynx, then I found Angel and bottle fed her because she was only about 2 weeks old, then I got Harley, then Blue was born. Lynx passed in 2003 and a few months later Ginger found us. Ginger is an amazing kitty and has a special place in my heart, but the original 4 will always hold places most dear because they grew up with me, were here when no one else was, human or furred. Goodbye my Blue Man Choo, I will always remember you. I am so sorry for you lost!! Hugs to you! !